When I wrote this post yesterday afternoon I was listening to some classical Arabic songs by Fairuz and Abdel Halim Hafez (my best friend Wihane can back me up on this because she called me and noticed the background music). I remember my childhood days when I used to beg my mom to turn off “that boring music” but I take that back. As a Lebanese expat, I sometimes feel out of place in NYC and the American culture in general so I guess that’s what drove me listen to music that is familiar and that is grounded in middle eastern culture. I decided to forget all preconceptions I had about classic Arabic music and just focus on the rhythms and meaningful lyrics. Abdel Halim Hafez’s songs in particular are incredibly rich and they go on for up to an hour! Can you believe that? It’s also quite interesting how different melodies are repeated throughout the same song, rendering distinctive characters each time yet tying the whole song together. Is that an expat thing, reminiscing on old Arabic music and the good old days? Anyway! 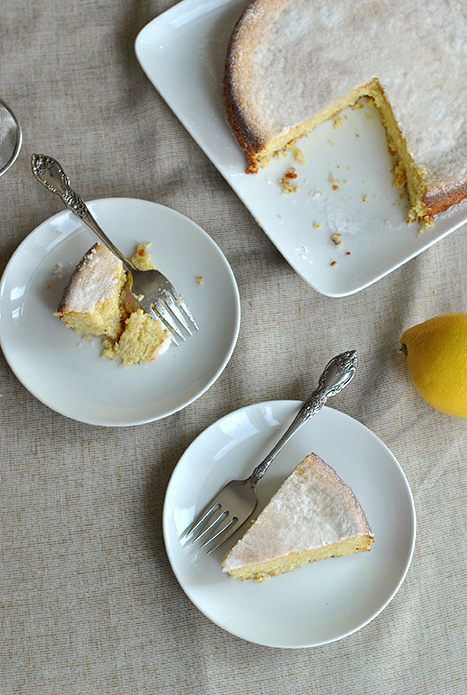 Back to this lovely Almond Ricotta Lemon cake: it is undoubtedly my favorite recipe this winter season. In fact, I love it so much that I lost count of how many times I baked it within the last two months! It’s THAT good. You guys, my grandma even wrote it down in her recipe book and bought a kitchen scale just to make this cake, which is A FIRST for sure. That makes me feel proud of myself. It’s a mixture of whipped butter, sugar, eggs, vanilla bean, almond meal, ricotta cheese, and of course lots and lots of lemon zest. 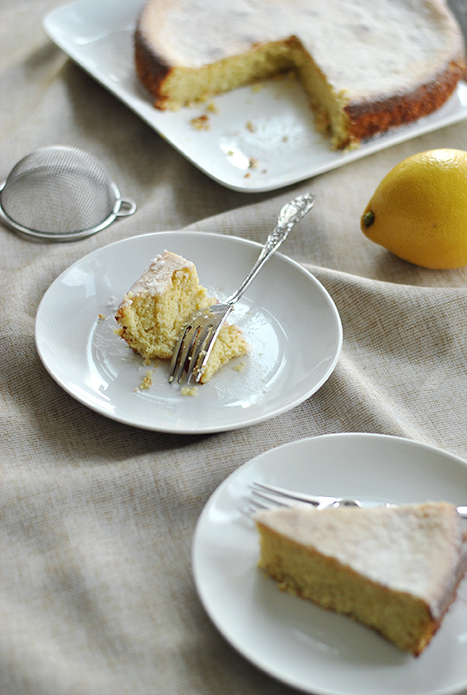 The first time I did this I thought the cake will turn out very dense because it is flourless – but to my surprise it is the lightest, moistest cake I ever tasted. It also has a beautiful, irresistible ground almond texture that melts in your mouth bite after bite. 1. Pre-heat oven to 160°C (325°F). Line the base of a 9″ (23 cm) round cake tin with baking paper and set aside. 2. Place the butter, sugar, vanilla seeds, and lemon zest in an electric mixer and beat for 10 minutes until pale and creamy. 3. Scrap down the sides of the bowl and gradually add the egg yolks one at a time continuing to beat until fully combined. 4. Add the almond meal and beat to combine, then do the same with the ricotta cheese. 5. Beat the egg whites in a clean bowl with a hand-held electric mixer until stiff peaks form. Gently fold half of the egg whites into the cake mixture. Repeat with the rest of the egg whites. 6. 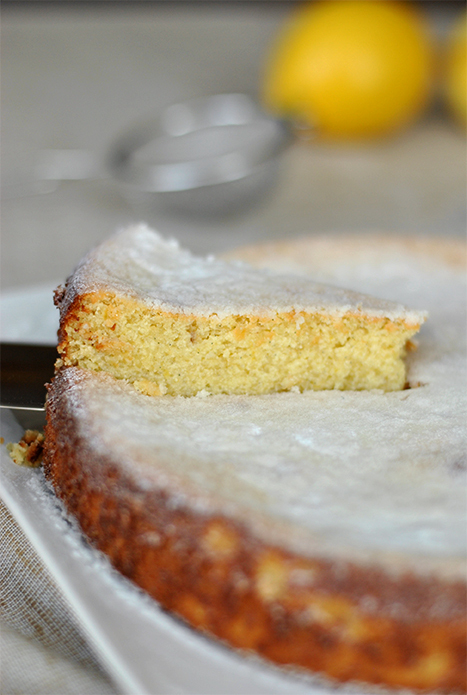 Pour the mixture into the prepared cake tin, smooth the top, decorate the cake with almond flakes (optional). 7. Bake for 40-45 minutes or until cooked and firm to touch. Allow to cool completely in the cake tin. 8. Dust with icing sugar before serving. Store in the fridge. Love the way it looks. In’shaa Allah will try this out soon. This looks perfect! Such a fabulous dessert! I have to try this recipe. It looks so good! Thanks for sharing.